While it may seem that the consumer camcorder market has been taken over with the advances in smart phones and DSLRs, there’s never been a better time to dive into the advances made in video quality from this section of the market. 4K video has been around in smart phones for a few years, which you’d probably think negates the need for a dedicated video camcorder. But if you want the best in video quality without paying for a pro grade video setup, a camcorder is still a great option. This camcorder falls into the category of ‘prosumer.’ Those who want better than average quality, but don’t want the lay out for top of the range gear, the Sony AX700 4K HDR definitely fits this category. The Sony AX700 4K HDR has the label of a camcorder and also the looks. A familiar camcorder design with a flip out screen and weighing just over 2 pounds, feels like it’s a quality build. The 4K feature is a big selling point here, but this shouldn’t be its only draw. The 3840×2160 of 4K above Full HD at 1920×1080 clearly gives more resolution, but it’s also about the lens and image sensor quality. The HDR (High Dynamic range) is also a fantastic addition, especially considering it wasn’t too long ago that this was only possible in postprocessing. Lens gurus will immediately be attracted to the ZEISS Vario-Sonnar T* lens which has been a long-term partnership with Sony. Accompanied with the 12x optical zoom, these features alone are a big step up from the footage found on a smart phone and should entice those wanting more serious video footage. 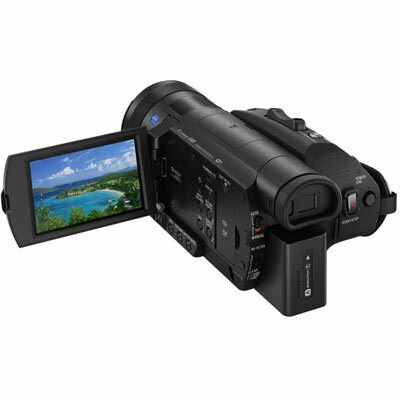 The Camcorder is also packed full of features which will give you a flavor of more pro end gear. A lens ring for manual focusing which can be assigned to focusing or zooming. There’s a nice variety of buttons and dials for further adjusting exposure such as shutter speed, GAIN/ISO and IRIS. If manual focusing isn’t your thing, then there’s plenty of autofocus options. A Hybrid AF system with 273 phase-detection auto focus points covers 84% of the image. The touch screen can be used to track your subject also extremely accurately. There are face detection features and other auto modes depending on your subject type. The sensor is a 1 inch stacked Exmor RS CMOS sensor, also producing 14.2MP still images. Aperture range is f/2.8-f/11 with a seven blade diaphragm. Along with the optical zoom there is 192x digital zoom and 4K: 18x, HD: 24x clear image zoom. This seems to use some form of digital processing, which allows zooming up to 18x in 4K and 24x in Full HD. There’s also Optical SteadyShot image stabilization with Active mode. The LCD screen is wide and bright at 8.8 cm(3.5 type) and it’s a good rendition of what you see. S-Gamut and S-Log video options are also available for more accurate post-production. There’s a huge range of video resolutions which range from 4K 30p, 24p NTSC and PAL, to slow motion formats 60p, HD: 240fps, 480fps, 960fps [PAL] Rec Format HD: 50p, 25p Frame Rate HD: 250fps, 500fps, 1,000fps. This coupled with plenty of picture profiles gives plenty of scope for more professional footage. There’s a built-in stereo microphone with mic level controls, which can record in MPEG-4 format and Dolby Digital and a small monaural speaker as a nice reference source. There’s plenty of connectivity on this camcorder like Wi-Fi, NFC, a Multi Interface Shoe for external mics and lighting, HDMI, STD Output and a headphone jack. There’s loads of features crammed into this camcorder and even some stuff which will be just fun to play with, like the NightShot infrared System. The Sony AX700 4K HDR once configured with some basic settings grabs quality shot footage, aided in part by the Zeiss lens. The slow and quick motion video options result in very smooth footage up to 960 fps. The only downside is the support of 60 fps in 4K. The camcorder maxes out at 30 fps in 4K. This means you have to choose between 4K resolution or the smooth footage of 60fps. The HDR feature also supports HLG or Hybrid Log-Gamma. HLG is viewable on compatible TVs giving you the full HDR experience. This is a pro feature, along with SMPTE Time Code and custom eight-digit User Bit code, allowing the best quality in a multi-setup scenario. There’s also control over color spaces, gradation and Gamma. Lots of ways to optimise the footage before postprocessing. When footage is viewed from the Sony AX700 4K HDR on a large 4K TV in the best resolution, colors are rich and image detail sharp. The lens lets in plenty of light and the manual controls definitely give you plenty of exposure tweaking. The clearest comparison is with the previous model the FDR-AX100. 1080/60p, 4K/30p, 24p 60MB/sec 4K and manual options, along with ND filter options made for a quality camcorder. There are quite a few features which are similar between both models, such as the Zeiss lens. However, there’s enough upgrades in the new version to make it worth the extra asking price. There’s certainly a lot of features in this camcorder making it a good choice as a prosumer unit. There’s just enough manual controls to not overwhelm the novice, but more advanced users may be wanting for a few more finer controls in the long run. The 4K footage is of good quality, even down to low light conditions, with plenty of frame rates to choose from. Slow motion modes come out very smooth looking and are especially fun at 960 fps. The position in the market for a prosumer camcorder means that it will always be a balancing act between not too many advanced features for the beginner, but enough to please the more professional minded videographers. An all round fixed lens is more than adequate for the novice, but limiting as with the manual controls for the more advanced. 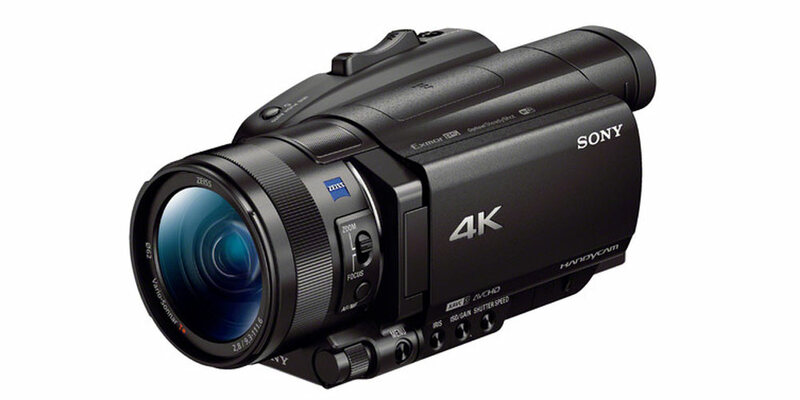 4K in 30fps will also limit the amount of semi-pros choosing this camcorders and option. As a general all-rounder camcorder that can produce fantastic 4K video with some manual controls which you can grow into, it’s a great choice. From the semi-pro upwards, you may be wanting for more manual control, but you can’t fault the footage for the price point.